The first races of the season are behind me! What a crazy [good] few weeks. 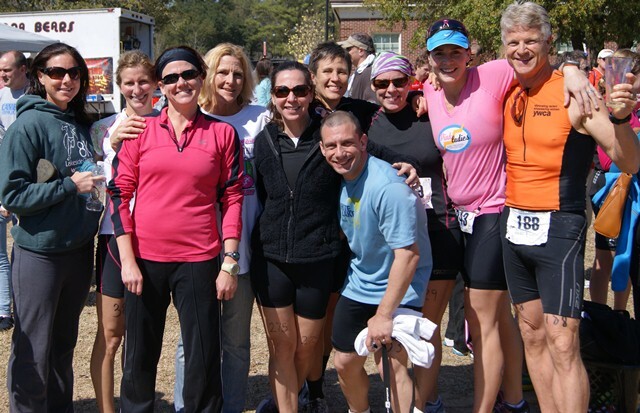 This mini race season began on February 17 with a 5k in Myrtle Vegas and ended this past weekend with one of my A races - the Azalea Sprint triathlon. I slipped in a 10K somewhere in between! I'll start with the Azalea. It was my fourth time doing this race and really my fifth time doing this course. 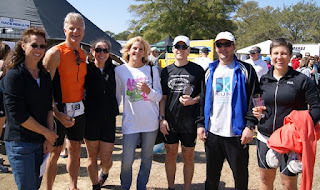 I competed in 2010, twice in 2011 [Saturday and Sunday events] and I raced the She-Tris super sprint in 2010 [it utilitizes the same course - with shorter distances]. I love it because it's what the YDubTriClub trains for and it's right in my backyard. Plus, everyone I know is in it! I admit I was initially more pleased with my performance in the tri than I was with my results. And, I admit I can barely explain what that means. I felt relaxed going into it, I felt strong and fast and controlled during the swim, I held my cadence and desired speed in the bike (except for the windy trek up Rose Ave) and I even split my run. I felt like I gave it everything I could on that day and didn't hold back. I stuck with my race plan and enjoyed every bit of the day. I met up with Meredith to head over to UNCW. I enjoyed the warm-up with Jen and Michelle - an easy run on campus. I chatted with members of our team. Body-marked a few athletes in transition (quick tip to skip the lines: bring your own Sharpie!). I organized my transition, did a warm-up in the pool and then slid into line. I think I looked too hard at the overall results. As usual, I compared my stats to last years' results and to the other women in my age-group. I was only 39 seconds faster than last year's first race and 2m44s slower than last year's Sunday race. I was ten minutes behind the leader in my age division. I disappointed. I think it's natural. I'm competitive and I love to see progress. I worked all day to let the negative thoughts slip from my mind. I focused on my friends' successes and found they helped [so did the post-race burger and beer at PTs]. Michelle finished her first tri in almost two years. Jen, Heather and Karen had first place finishes and Brian, Lawrence, Beth and Tina had podium finishes, too. Anne and Mere saw improvements and everyone in general had an amazing time. Last week, my thoughts balanced out. The memories of the day started to win out over my results and I focused on my improvement (15 seconds faster in the swim and 30 seconds faster in the run). Even better, I started to do my favorite thing: plan for the next race. It didn't take long for my mind to shift into what I can do better for Belews in April. The competitive mind is a terrible thing to waste.